The 2015 edition of the Dakar Rally is set for its flag off on the 4th of January, 2015. One of the most gruelling and physically demanding motorsport events in the calendar, the participants will travel through Argentina, Bolivia, and Chile this year. The route will be divided into 13 stages – the first spans across Buenos Aires and Iquique via Villa Carlos Paz, San Juan, Chilecito, Copiapo, and Antofagasta. Iquique will host the rest days – 10th Jan for motorcycles and quads and 12th Jan for cars and trucks. The 11th of Jan however will be race day for all the categories to Uyuni and back. The return leg from Iquique to Buenos Aires will be through a different route – via Calama, Salta, Termas Rio Hondo and Rosario. The race will include Marathon stages where the competitors will be required to compete without their technical back-up. The liaison stages will allow competitors to communicate with the technical team in case of a breakdown etc. The longest and the most gruelling of the liaison stages is the 726 km 12th stage. 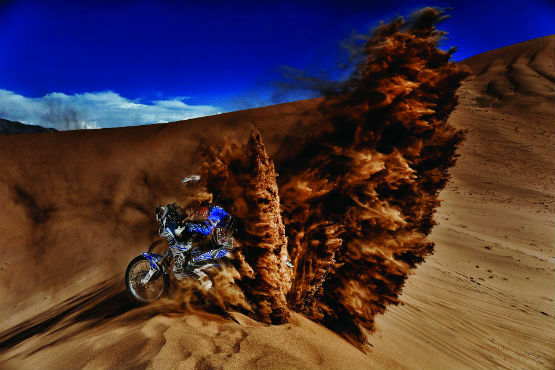 Spread over a total of 9,000 km and three countries, the Dakar will play host to 168 riders, with more competitors participating on quads, cars, and trucks. Amongst these will be CS Santosh, the very first Indian to participate in the Dakar. After winning the Raid de Himalaya in his debut year in 2012 and racking up trophies in domestic motocross and rally events, the 31 year old will now race with a 450cc KTM. More Indian representation at the event comes from the Sherco TVS Rally Factory team. This is the first time that TVS is entering the Dakar event as a team-owner and as we reported earlier, will be partnering with Sherco Motorcycles of France. The Sherco TVS Rally team will field an indigenously developed RTR 450F, built jointly by the two. French riding duo Alain Dulcos and Fabien Planet will take the mantle for the two RTR 450Fs in the competition. The video below will definitely get your blood pumping, and build up your anticipation for what should be another stellar season for the Dakar Rally.